Although it had been a running clock throughout the fourth quarter, there was still just enough time for a little history. 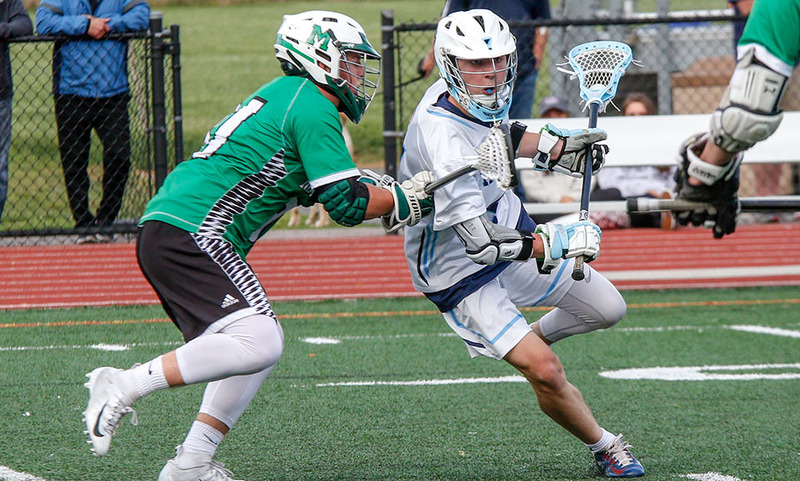 In the final minute of a game that had long been decided, Franklin raced the ball up the right wing and immediately looked to find senior attacker Eric Civetti. He got it outside the crease on the left side and drove to the cage. This wasn’t about the Panthers trying to run up the score, but to give the program’s all-time leading scorer the opportunity to set another record with his ninth goal of the game. Twice, Civetti had tied the record with eight in a game, but now he stands alone. 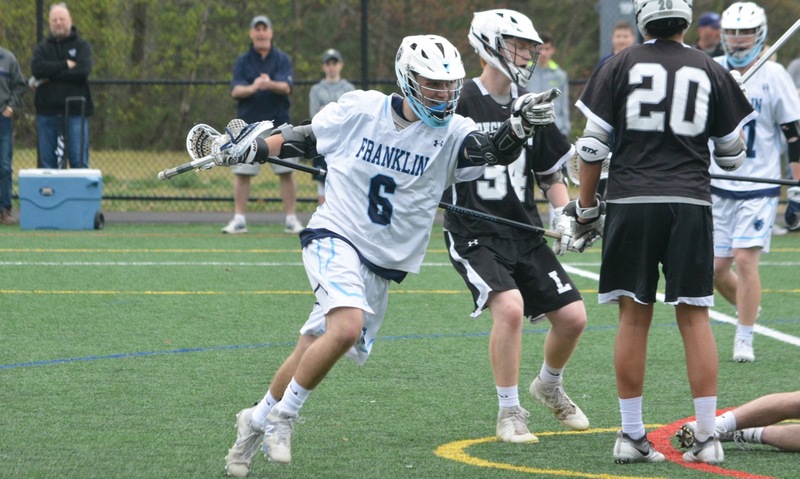 Even more important for Franklin was that the nine goals were part of a dominating 22-8 victory on Sunday afternoon against Longmeadow, one of the top-ranked teams in the state. This was the third time this week that the Panthers had scored 20-plus goals in a game. The first two were against a pair of the state’s newest programs (Taunton and Stoughton) and on Sunday it came against one of the state’s best. The spotlight was rightfully on Civetti after the game. He scored four times in the opening quarter, as the Panthers jumped out to an 8-0 lead, and had seven goals by halftime, including his by now trademark around-the-defender’s-shoulder, no-look shot while backed up on the edge of the crease. He scored again to start the second half and then finished the game with one last goal in the closing seconds for the record. It had been a difficult start to the season for the Panthers outside of league play. While Franklin is on the brink of another Kelley-Rex division title, the Panthers had struggled offensively against non-league opponents like BC High and Walpole and were in need of a marquee win on their resume. While the offense will get the plaudits, the Franklin defense also stood tall against the powerful Longmeadow attack, Jack McGrath was tenacious with his close marking and O’Rourke made 14 saves, consistently coming up with big stops to stem the Lancers’ momentum and with accurate outlet passes that got the Panthers going in transition. Civetti opened the scoring five minutes into the game and, following one of O’Rourke’s big saves, he then made a perfect pass from behind the cage to set up Zach Alexander in front. Chase Tanner rifled in Franklin’s third and Civetti spun a defender into the ground before finishing in close. The Panthers were rolling and turned a big stick check from Trevor Raffin into a transition opportunity. LSM Patrick Morrison and Jake Davis played a give-and-go that left Morrison open for the fifth goal. Freshman Matt Lazzaro got his first with a rip to the corner, Civetti cleaned up the rebound of a Tanner shot, and then Civetti was given all day to wind up and fire. Longmeadow scored at the buzzer to close out the first quarter but it was already 8-1. 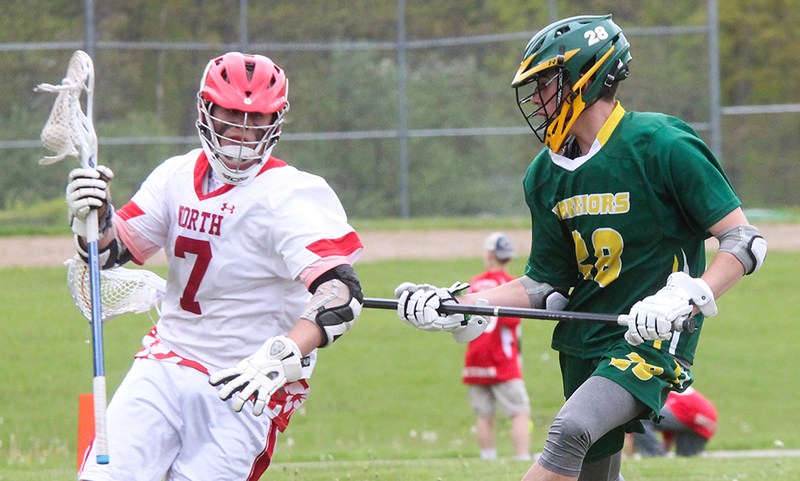 Jacob Alexander had controlled the face-off ‘X’ against one of the state’s premier face-off guys, but the Lancers started to win a few in the second quarter and started to cut into the lead. Civetti made it 9-1 but the visitors scored back-to-back goals before Tanner went low angle with a shot from distance through a crowd of legs. Civetti would score twice more before the half but the Lancers scored three and it was 12-6 at the break. The thought of a comeback was ended in the first three minutes of the third quarter. O’Rourke intercepted a long pass and quickly started Franklin’s break with Davis feeding Civetti for his seventh of the afternoon. Nitin Chaudhury scored with a bouncing shot after racing straight down the middle of the field and 17 seconds later Jacob Alexander finished off a quick break from Sean Lazzaro’s pass. After a pair of huge saves from O’Rourke while Longmeadow was man-up, Chaudhury set up Will Harvey for a goal and a 16-7 lead. Civetti again played provider on the next goal, picking out a cutting Matt Lazarro, who took the pass on the run and in one motion went behind his back to the top corner. Davis tacked on two more, including a missile to the top corner at the buzzer and Franklin went into the final quarter with a 19-7 lead. Kyle McEniry (from Chaudhury) and another rocket from Davis (three goals and four assists) pushed the Panthers’ lead to as many as 14 (21-7). Franklin (11-2, 9-0) will get back into league play on Wednesday night against Oliver Ames and can clinch at least a share of a sixth straight Kelley-Rex division title. FRANKLIN, Mass. 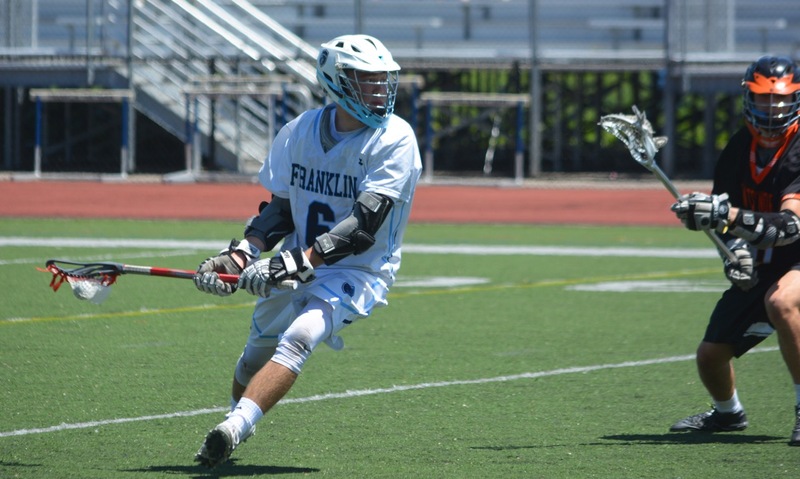 – The Panthers recently clinched another outright Kelley-Rex division title, Franklin’s third straight outright league title and fifth in a row overall, but there was still a feeling that the team needed a marquee win to add confidence ahead of the state tournament. 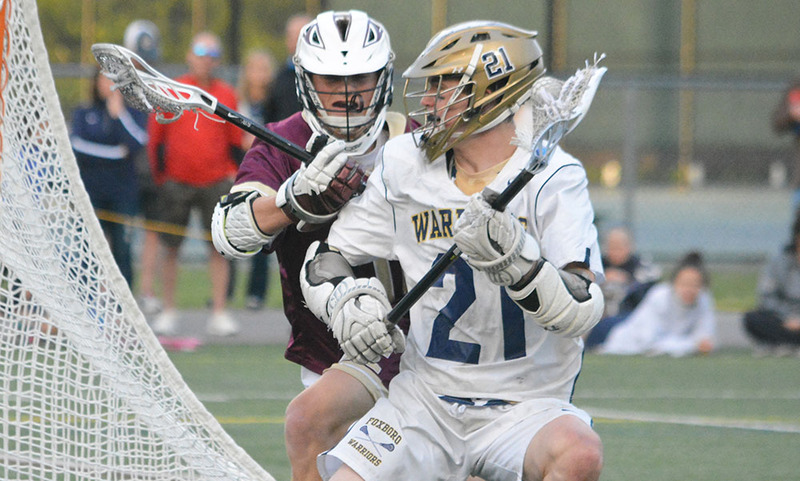 On Saturday afternoon at Pisini Field, Franklin was determined to make a statement about its potential for another tournament run against Newton North. Behind six goals from junior attacker Eric Civetti, eight saves by junior Connor O’Rourke, and a strong performance at the face-off ‘X’ by sophomore Jacob Alexander, the Panthers jumped all over the Tigers and earned a 9-6 win. 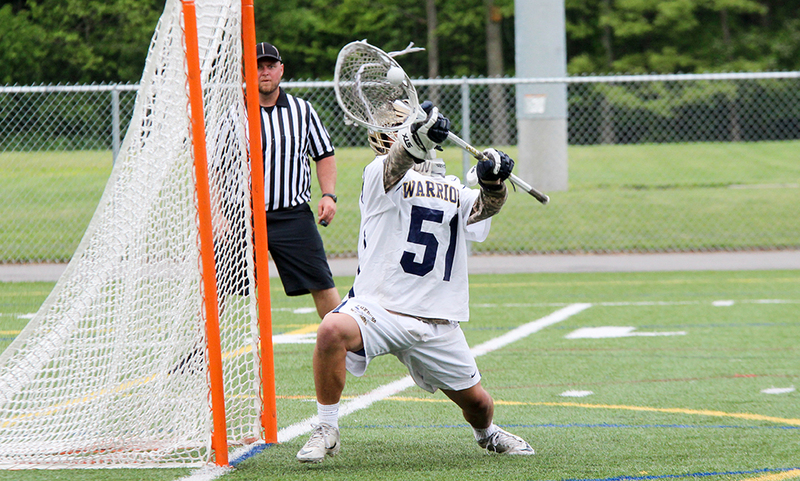 Despite being the focal point of the Newton North defense, Civetti showed the range of his skills, scoring from long range and using his strength around the crease. The Rutgers University-commit scored three goals in the opening quarter and left Tigers coaches scrambling for a solution. The Panthers stormed out of the gates to take a 3-0 lead in the first quarter. 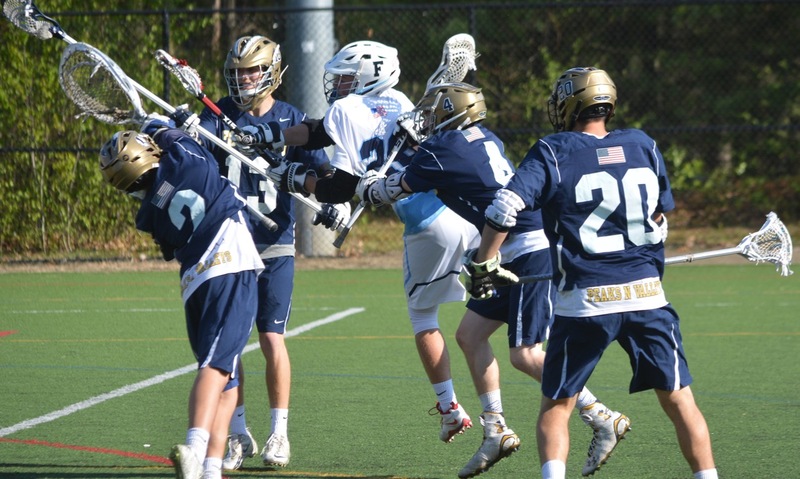 Alexander won the opening face-off and the Panthers held the ball for two minutes before Packie Watson fed Civetti for a close range score. The Tigers struggled to get any possession in the first and Franklin nearly doubled its lead when Nitin Chaudhury smacked the crossbar with a shot on the run. A minute later, Civetti muscled his marker to score on the edge of the crease. With 2:22 left in the first, Civetti got his hat trick with a move from behind the cage. He pump faked a pass out in front that forced both Newton North defenders to take a step back and Civetti took advantage of the space to step in and finish with a backhand shot under the bar. The Tigers got one before the end of the quarter (a highlight reel quality, behind-the-back shot by Bryce Adam) and then cut the lead to one early in the second. Civetti responded for Franklin. After smashing a shot off the bar that looked like it may have crossed the line, he collected a loose ball and went with a low angle shot into the corner. Newton North had an opportunity to make it a very different game with eight minutes left in the half when it had a two-man advantage for 30 seconds, but O’Rourke denied the Tigers a crucial goal. O’Rourke made three saves during the man-down situation and Watson made the visitors pay when he scored in transition to turn a potential 4-3 game into a 5-2 lead. That proved to be the turning point, as Franklin took control and put the Tigers on their heels. Sam Arsenault picked out Chaudhury on the edge of the crease to make it 6-2 and finish off a great move by the Panthers that saw everyone in attack touch the ball. Civetti got his hands free and time for a rip into the top corner for a man-up goal early in the third and Arsenault added a goal off an assist by Kyle McEniry for a six-goal lead. The Tigers scored right before the end of the third, but Civetti restored the lead early in the fourth when he finished a transition sparked by a long run from sophomore pole Patrick Morrison. The Tigers tried to make it close at the end, scoring the final three goals of the game to get back within three with 1:24 remaining. It was hard to get a run going though because Alexander continued to win every face-off for the Panthers. He won 17-of-20 for the game, including all five in the fourth quarter to help slow down the Tigers momentum. Franklin (16-3) will finish off the regular season with Div. 3 power Dover-Sherborn on Wednesday and is expecting to be one of the top three or four seeds in the upcoming state tournament.